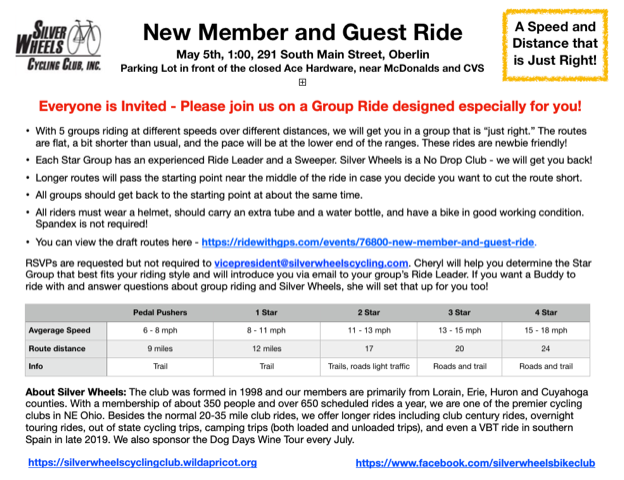 Silver Wheels Cycling Club, Inc.
What began in 1998 as just a way to ride with a few friends has turned into one of the area's premier cycling clubs. With a membership hovering around 350, we host over 600 events each year. We try to offer something for just about every cyclist, from beginning adults to enthusiasts to those pretty serious about the sport. Our members hail from all over Northern Ohio including the counties of Lorain, Cuyahoga, Erie, Medina, Huron, Summit, and Richland. Don't be fooled by the word Silver in our name. Our members range in age from teens to over 90 and an average around age 55. We have an almost even split of 50-50 males and females. We work hard to create a fun place to be for anyone who wants to ride. First time guests welcome any time, on any ride. Explore this website and see what all we have going. Click here to check to see what is going on with our sponsors. They offer sales and events they want you to know about. Click on the above link to view our special section on bike education and safety.